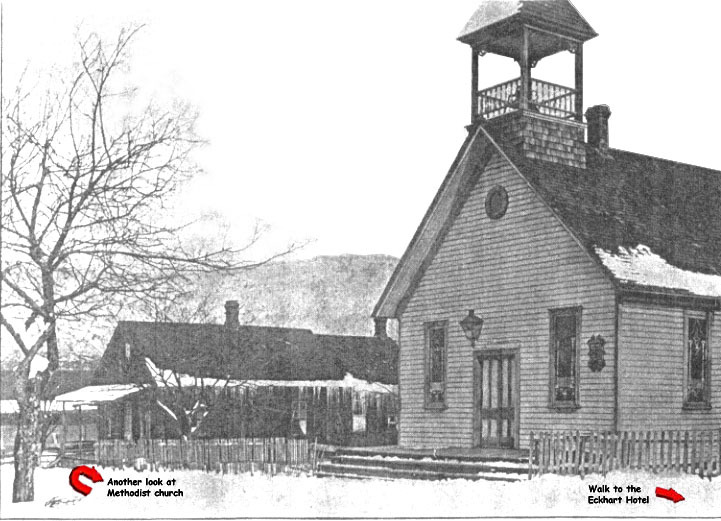 On October 26, 1894, five prominent men of the community of Hazel Hurst applied for a charter to the Court of Common Pleas of McKean County, Smethport, Pennsylvania, to form a church to be known as the First Hazel Hurst Methodist Church. The original trustees were George Harrington, E.M. Cheesman, P.D. Henderson, S.D. Karr and W.F. Foltz. The charter application was granted December 10, 1894. The five charter members were Jennie Cheesman, P.D. Henderson, Vernie Karr, Nona Henderson and F.D. Karr. F.D. Karr was the first superintendent of the Berkalew and Bayless Chemical Works in Hazel Hurst. The lumber for the church was donated by Benjamin F. Hazelton, the founder of Hazel Hurst. He had built a saw mill north of Marvin Creek in 1892, primarily to saw hemlock which was abundant on the hills surrounding the town. The town grew rapidly and flourished, bringing with it the building of many private dwellings and businesses. The lumber was sawed by Joe DeShetler. The construction and carpentry work was performed by employees of Hazelton. Services were held as soon as the roof was completed. With the sides incomplete, no furniture and no pews – services were held with the parishioners bringing their own chairs. The church was furnished over the years through gifts and money raised by the Ladies Aid. Their most successful money making activities were suppers and spring strawberry festivals. In 1900, the church sold a souvenir photo packet that included pictures taken around Hazel Hurst. The first clear glass windows were replaced with stained glass by church members and friends as memorials to departed relatives and friends. During the years from 1894 to 1898, the church was part of the Mt. Jewett charge and the ministers lived in Mt. Jewett. The first minister was Dewitt M. Carpenter who served from 1894 to 1897 and was followed by Dr. O.H. Nickle, who served until 1898. Membership increased steadily as the town’s population grew and much interest was aroused in the church during this period by the evangelistic services of Reverend Hathaway in 1896 and of Miss Gertrude Rumsey and Mrs. Gilson in 1897. In 1898, the church became a separate charge with its own minister. The first minister that resided in Hazel Hurst was W.L. Hazen who came there with his bride in November of 1898. There was no parsonage at that time so they resided in an apartment on Main Street. About 1900, a small building immediately north and adjacent to the church was purchased and remodeled as the first parsonage. As shown on the 1909 Sanborn Map Company’s map section of Hazel Hurst, the church is located on Harrison Avenue – north off Main Street. The parsonage is located immediately north between the church and the Pittsburgh, Shawmut and Northern Railroad depot. The first parsonage was sold to Harry Spangler, remodeled, an addition built on and moved to the corner of Main Street and Cleveland Avenue. Sometime between 1904 and 1908, a larger, well constructed boarding house was purchased and moved from Dewey Avenue in Belgium Town to the same site where the original parsonage was located. Pastor Hazen served until September of 1900 and was follow by Pastors W.B. Linn, R.A. Parsons, G.N. Gage and W.R. Buzza through 1906. In 1906 Pastor A.S.M. Hopkins came and stayed until 1911, followed by M.E. Muder in 1912 and 1913. During his time there was a large men’s and women’s bible class. In the fall of 1913, Pastor C.C. Mohney came and during his time had many revival services with Pastor Maitland which greatly increased the membership. Following him, Pastor C.J. Zetler served from 1916 to 1920. From 1920 to 1928, other ministers who served there were Henry Smallenberger, C.M. Burnett, Mark Perry, Thomas M. Sheesley and E.C. Hasenplug. During the years from 1894 to 1929, Hazel Hurst had gone from a boom town and then declined to nearly a ghost town. It began and prospered as a lumbering town, then entered a new era of prosperity as window and bottle glass manufacturers built their plants there due to the discovery nearby of high quality sandstone and supplies of natural gas. From February 1899 through December 1929, five glass companies located at three sites within the town introduced a new era of prosperity. During this period, the church, now known as the Methodist Episcopal Church, flourished and prospered. From pledges, tithes and free will offerings – pews were bought, a pipe organ was installed and other significant church upgrades were performed. The Ladies Aid continued with chicken suppers and strawberry festivals. Sunday school attendance had grown so large that some classes were moved from the church to the parsonage next door. Youth work was carried on within the Epworth League and Junior League organizations. Missionary societies were organized, one for women and one for girls, and debates were carried out in spirited monthly meetings. Sunday school classes were organized and social meetings were held at leas monthly. During the years of decline leading to the Berney Bond glass plant closing on December 18, 1929, the church reverted back to the Mt. Jewett charge in 1928. The pastors who served following this were M.I. Harding (1928-1929), Louis E. Elbel (1930-1934) and R.A. Thompson (1934-1940). In 1940, Pastor Thompson retired due to ill health and purchased and remodeled the parsonage. The church used the proceeds from the sale to build two school rooms as additions to the church. Pastor Thompson lived in the parsonage building until the early 1940’s when he sold it to Harry Himes. After his death, the property was acquired in 1970 and occupied by Guy and Kay Raught. Pastor Clyde C. Ross (1940-1943) was followed by Herbert L. Schuckers (1943-1946) who presided over the 50th golden anniversary which was celebrated on October 22, 1944. In 1946, the name of the church was changed to the Methodist Church of Hazel Hurst during which time Raymond J. Hurst (1946-1957) was pastor and church membership increased. The church was remodeled and redecorated, a piano was added along with new hymnals, choir robes, flags, carpets, furnace, lights, and vestibule, outside steps and a new roof. A rededication of the church was held in the fall of 1955. On April 1, 1962, a ground breaking ceremony for a church school annex was held by Pastor G. Mason Crites (1957-1962), the district superintendent, Reverend Smallenberger and the church congregation. The annex consisted of a kitchen, a fellowship room annex and two rest rooms. The entire interior of the church was redecorated and new carpeting was installed. New school furniture, kitchen furnishings and a new organ were bought. Construction was performed by members of the community and the work was completed in the early winter of 1962. Pastor Crites was followed by E. Eugene Ankeny (1962-1965) and Ralph H. Eckert (1965-1970). During the early morning of July 20, 1967, the church was completely destroyed by fire of unknown origin. Services were held at the Rebekah Hall until the purchase of St. Edmund’s Roman Catholic Church on November 21, 1967. Services were first held the Sunday before Christmas in 1967. Make shift altar furniture was used and the congregation worked to remodel the chancellery, paint the inside of the church, lay new carpet and obtain new altar furniture and an organ. The church was dedicated October 13, 1968. Ground breaking ceremonies were held on June 8, 1969 to construct a religious education building annex and kitchen facilities. The name of the church was changed to the Hazel Hurst Methodist Church.